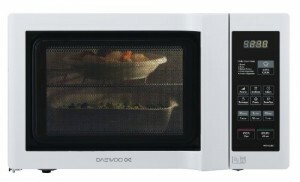 Featuring 5 different power levels and 2 shelves, the Daewoo KOR6L6BD is a 20 litre, 800w cheap microwave finished in white. 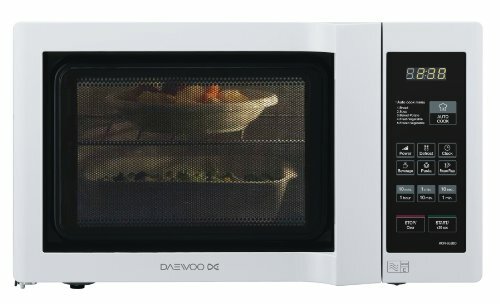 The main selling point of the KOR6L6BD microwave from Daewoo is the shelf - this enables you to simultaneously heat or cook two dishes - ideal timesaver for those who need to heat plates prior to a meal. It provides 800w of power from within it's medium sized capacity of 20 litres - overall external measurements are 44.6cm by 27.0cm by 32.4cm. The 5 different power levels should provide a setting suitable for most tasks - and the buttons are easy to use. This microwave oven has no dials - just clearly labelled buttons - with several preset options, with the timing options situated below. The white interior wipes clean pretty easily - and so it should be a problem to maintain this microwave's new looks. The overall design is just white and black - not much in the way of colour - and so it should suit most kitchens in terms of colour scheme. 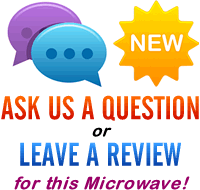 During our test it cooked well - with no cool spots - and we'd be happy to recommend the Daewoo KOR6L6BD as an ideal cheap microwave for those on a budget. Overall a decent looking microwave, with the handy addition of a shelf - so you can heat up multiple plates without balancing them. Looks good and works well.